your objective is to keep the being alive until the green bar (time) fills up. *you press the required buttons, the required number of times. 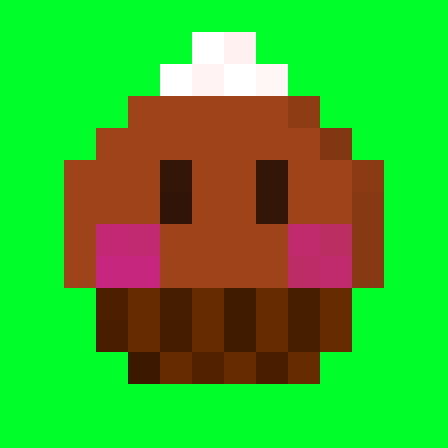 a simple toy I made. 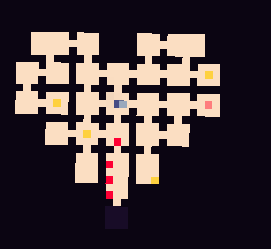 this is a puzzle game, simple, yet hard, there are a total of 16 rooms now and I'm not sure if I'll add more. also showing how to get the secret sword: the divine happier. so using a mouse or controler won't really help here. 3 of them are in the area you spawn in, 3 of them are in the middle of the tower. When you are at a complicated position, you may always backtrack there to replenish your health. simply destroy the enemies and get out of there. there will be a heart container waiting for you inside the statue now. (I call her baddie), instead, go left, foward the first dot. a platform will go up, allowing you the first key. in this room a bridge is formed on the upper and lower part by aproaching them. 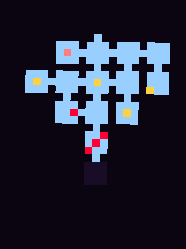 on the boss room you'll want to have all four hearts full and take a few tries to figure out it's pattern. the forest is the upper area of the hub. giving you an extra reach to your sword. kill all monsters in there in order to unlock the key to the next area (and opening the initially locked gate). on the following room you have two options: run for it and go to the left door or defeat the optional mini boss. once done, there will appear another portal on the upper right corner allowing you to open another gate. this boss is a bullet hell boss. visibility, here you can use O and P to move your camera, but either way, your vision will be patially blocked. the same head will also shoot a number of health pickups from time to time, remember where they fall. besides that, the easiest way is to hit while it is cooling down and the fastest way is to hit it on it's blind spot. here you can atack left when it's aming right and vice versa, again, be careful with the little slimes. right here you may wait before killing it in order to get many health pickups before the arrow totem reaches ground. 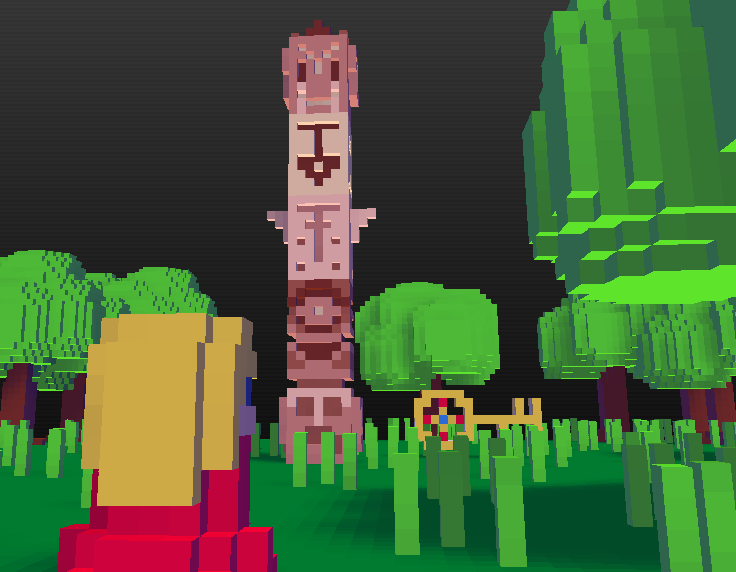 the last totem can't hurt you, you can just hit it to death. where you have to defeat many enemies in order to advance to the next floor. randomly duplicate itself once and once it's defeated it'll leave a health pickup. by choosing the path to the right. that portal can only be entered once so be certain that you have met all conditions before going in! 4000 worth of points on the extra points pickups. this level is an alternative to the robot vs dragon cartridge, since I already played it but wanted something different, this level featues 4 diferent guns and 2 subweapons which may or may not be used by the player, 2 bosses and a few arenas, enjoy! this level includes the flame gun used in this cartridge, but not as a main weapon, that gun is not mine. Rubberthis is a fun one, unlike the seeder you can't get hurt by your own bullets, they have amazingly high damage, can multiply and bounce around but you have limited ammo. when the bullet hits something for the third time it will drop a rubber ban (ammo) but if you don't collect it in 3 seconds it will explode and the explosion can hurt you. While it seems like a hard weapon to manage, you can easily fill up your ammo by standing against a wall and shooting it so the bullets won't die away from you. seeder: the green one is the hardest weapon of all, it shots a bullet that multiplies itself over time, getting darker and stronger, however, as it spreads it may also hurt the player, making it very dangerous and, even though it has the biggest Area of Effect (AoE) it may kill you instantly. jetpack:boosts your jump and slows your fall, it has a little delay to avoid exploits. the spear is excatly that, a spear which you trow at the monsters, however, when you use it you have to pick it up again to use it once more, it would be great for puzzle games like pressing the button on the map. I couldn't, however, manage to make the trowing distance controlable. your sword attacks when you collide the character front, for a better gameplay, the mob must also have the modifier used on the map for a nice knockback, is doesn't, however, protects the sides or back but it makes you invincible to bullets when you press shoot. 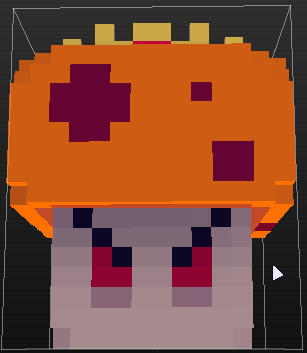 this one works almost the same as the normal sword, the diference is that this one is customizable! you can change its size by simply changing the time or the size of the bullet, and depending on the bullet emitter it can have a lot of cool effects, like a sword in flames or a sword that bends like plastic, etc! I also made a monster spawner gun so you can test the weapons. looking foward to see you using those! I'm sorry, I just, had to do it. So I was working on my second part of the enchant levels and I wanted to add a little bonus (which is actually a big thing) on the third room you see this big monument on the middle of it, it is a decripter, and it works pretty much like fez's tetris code, but if you press all the buttons at once it simply activates all the modifiers needed to the event of the code, is there a way to avoid this? 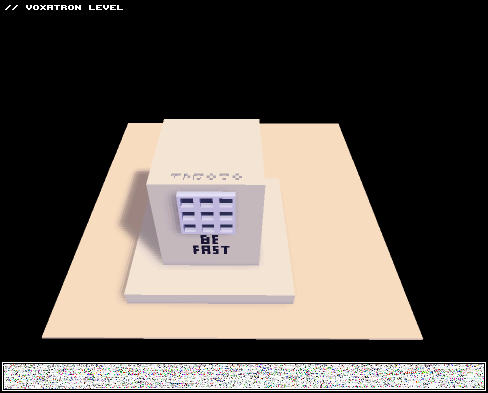 like, allowing the player to press the right buttons but to reset the sequence if he gets it wrong? This level is a WIP, I was messing up with the character controls and realized I could make something completely different from the normal controls, there is yet much to do, maybe some tweaks with the control, a better aim system but mostly monsters and rooms it needs more work there in my opinion, but I would like yours too! what do you think of this gameplay? Should I add something? (like the idea of protecting a being while playing the level, some sort of companion or anything?) should I change something? (the gameplay, the monsters... anything) or should I delete something? anyway any comment is apreciated. 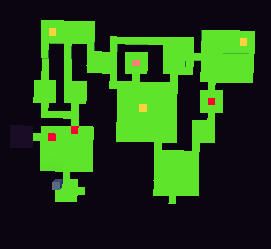 update: this project was canceled due to unfluid gameplay, it was just too anoying to go up and down to where you wanted and in the end I gave up, it would make more sense to use these controls on some sort of rage game where everything goes against you, but that wasn't my idea. if anyone wants to work on this project or use it for something else, I won't stop you. also, as a workaround for the life bug, I made a system of absoving/attacking, where you absorb your hits as hp if you are not attacking, there are no life boxes anymore. but it seems that you absorb more than you would lose if you were attacking if you get hit by the red cannon, I wonder why. this level is simple, survive 5 minutes, the time is presented by the bar shown in the image, which fills one bar on each 10 seconds. Collect the items the yellow cubes leave behind, they give health and increases your score but surviving is more important. yet, there is a problem here, at some point on the game, the bar that shows the countdown disapears, it was because there was too much being created at the samer time so I simplied the level a bit. so I know most of us are just waiting (for a long time by now) for the 0.2.10 (which is a number that kinda feels strange for me) but I want to do something while zep works on volumetric lightning, two player and things like that. so I have a proposal: let's do a jam! why jam? because we want that update so we can make our wonderful ideas true! as a deadline, what about march 26? do you think that this much time is enough to make a level until then? it can be any word! if you're lacking on ideas to do so you can always use the random word generator. 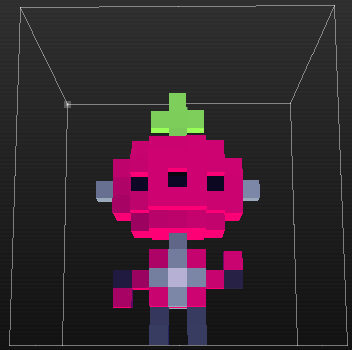 this is not a contest, no one is to be judged, but it would be nice if we showed zep how much we wanted voxatron to become complete. would you participate in this jam? this is not a game, it is an experiment.